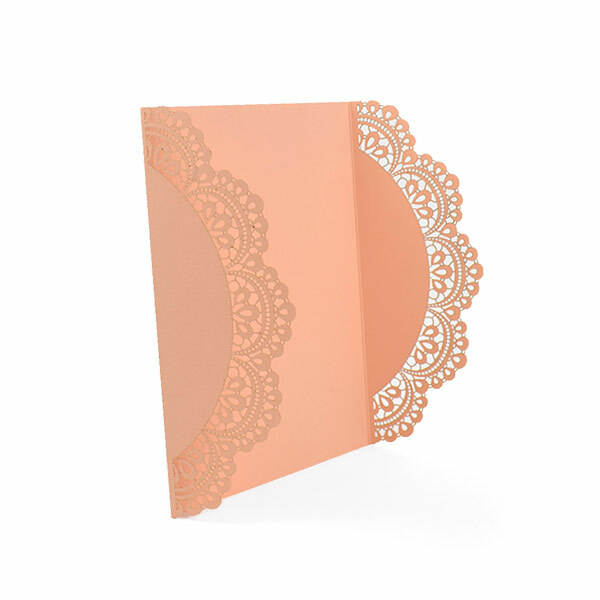 Dainty with a touch of rustic charm, our Lace Doily Laser gate card is a sweet choice for wedding invitations. It carries the vintage vibes of an old cloth doily, but is more sophisticated than a paper doily you’d use for Valentine’s Day. 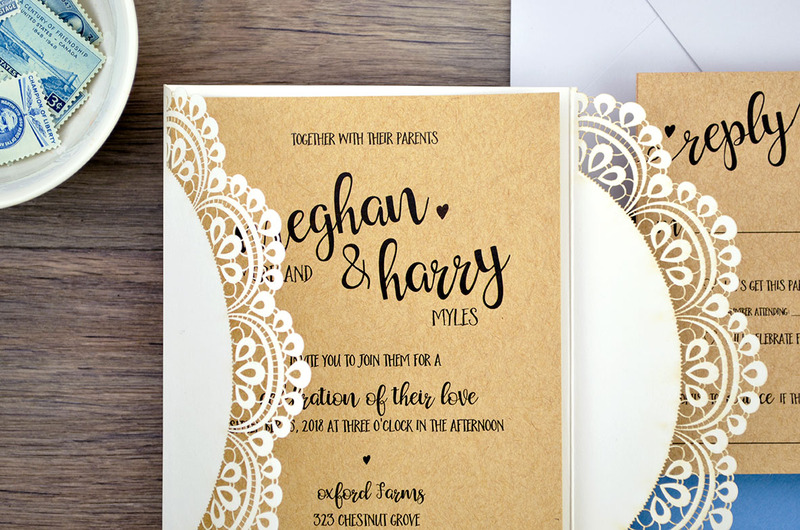 This suite has fine laser cut details, a unique presentation, and is so easy to assemble. 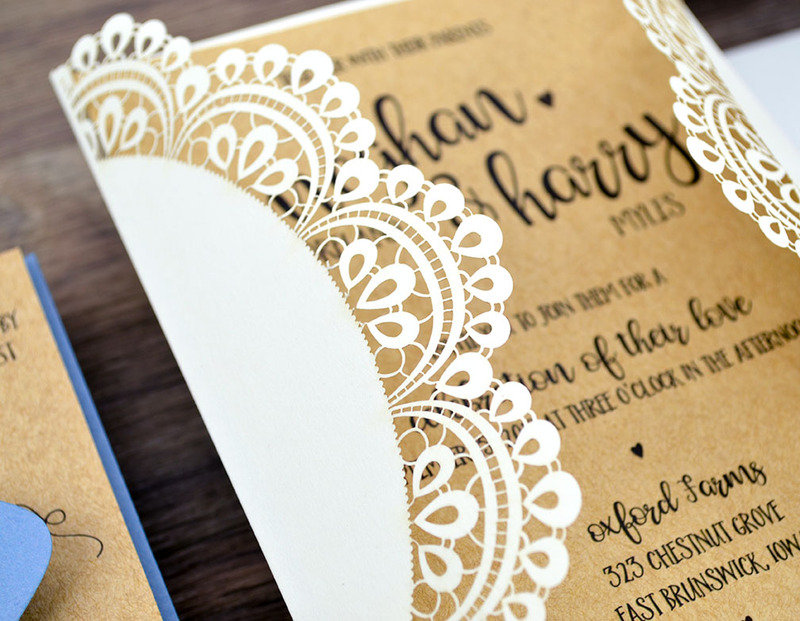 Plus, it uses one of our free wedding invitation templates, which makes it affordable for brides on a budget. 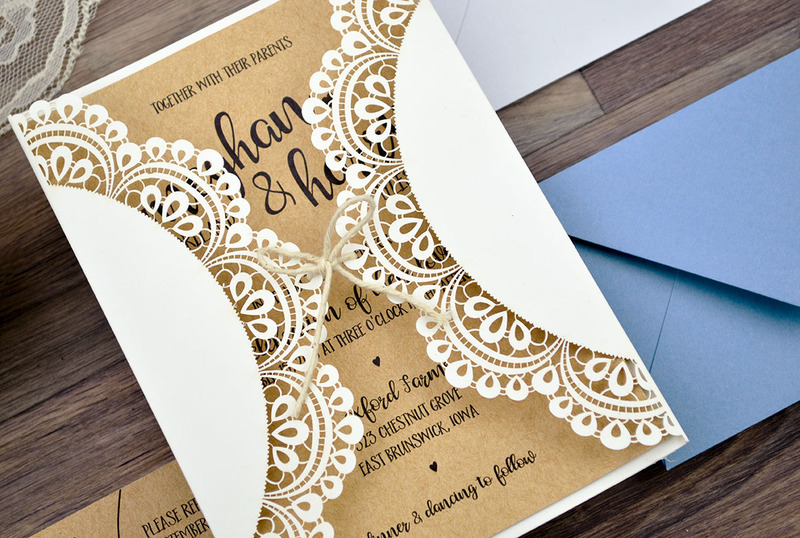 To start this invitation, customize and download the “Rustic” free invitation template. You’ll need to resize to 4.75 x 6.75″ to fit the gate card. We changed all of the text to black before downloading, and printed on rustic Straw Kraft paper. 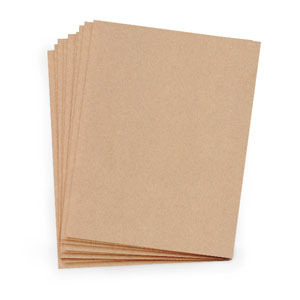 You can order cardstock in the color of your choice and print at home to save. 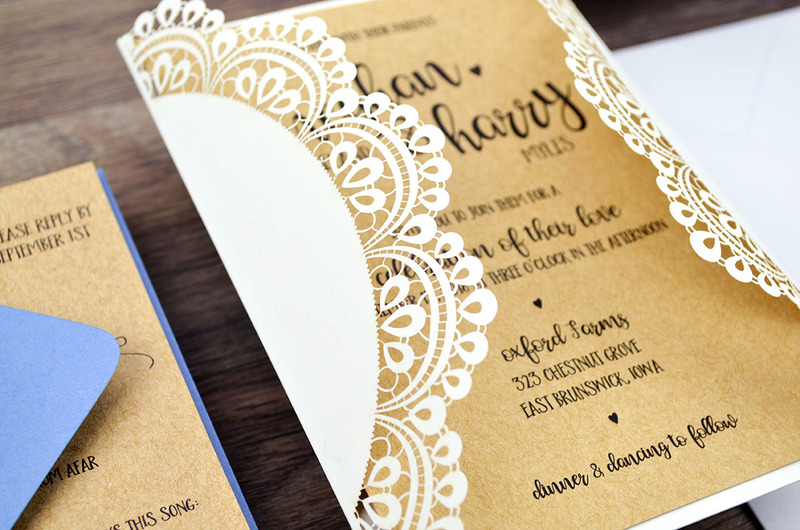 To assemble this invitation, use Zip Dry Glue or a tape dispenser to put adhesive around the edges of the back of the invitation card. Center and attach to the center panel of the gate card. 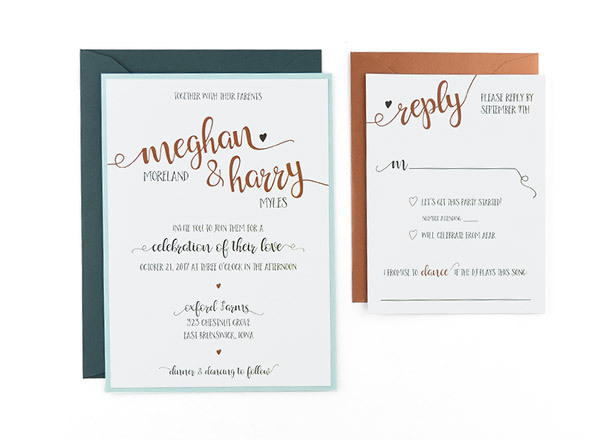 Tuck your RSVP card under the flap of your RSVP envelope, and place it on either on top of your invitation card or on the back, depending on your preference. You can leave your gate card as is, or fasten it closed with a bellyband, twine, silk ribbon, or whatever you’d like to use. 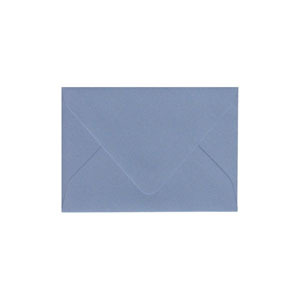 Tuck the whole thing into your pre-addressed mailing envelope. 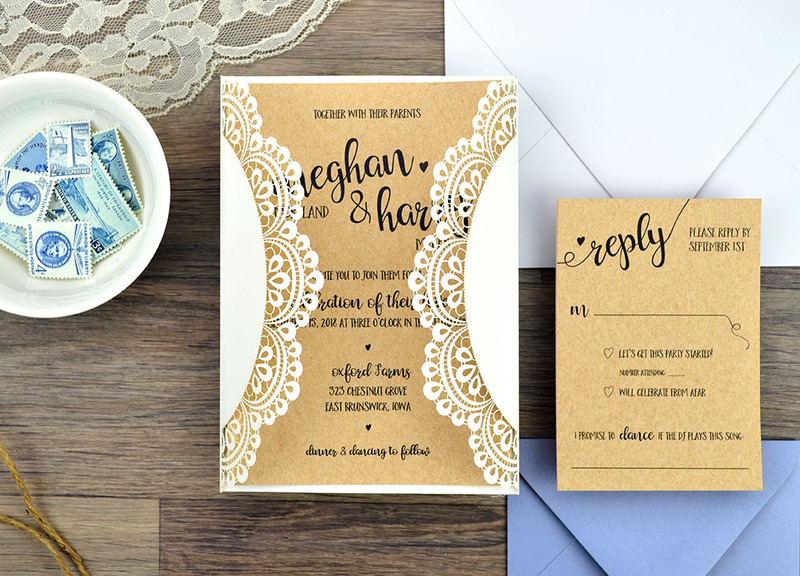 You can change any of the colors to modify the look, add an invitation mat to add in another color, or add a monogram tag to your twine before tying it closed. 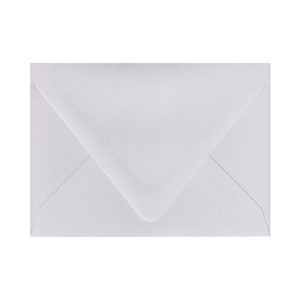 We recommend sealing with envelope moistener with adhesive for a secure seal.